At a certain point of time, CipSoft had a test server -- client version 6.98. Since the client is so old and since it was not an official client, it has now been long forgotten and has disappeared into the abyss. I couldn't find a trace of it anywhere. A major part of the testing of that client was to introduce the new outfits (the ones that we now know as "oldschool/retro" outfits, released at client version 7.0). Before that, the outfits were from the client versions pre-6.0. They were looking like this. At the 6.98 test client, the outfits were changed to look like this. Some of you may recognize these outfits. They are actually the basis of how dead female corpse and dead male corpse look like. In fact, they've become quite popular and many people try to mimic to look like them. But they look quite different from the normal retro outfits that we have today in our 7.x clients. These outfits are special. They're looking more contrasted somehow. On many OTs you can actually use these outfit with the outfit IDs 127 and 126. Unfortunately, they are missing walking animations and you cannot change the colors either. 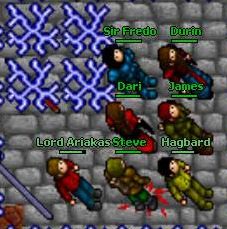 I found an old picture of CipSoft members and senior gamemasters messing around on the 6.98 test client. The outfits they had were similarly contrasted, but they could change their colors aswell. I always admired this picture, and I was hoping one day to be able to get my hands on these outfits. But the 6.98 client does not exist anymore. The outfits are gone. Until me and @ond decided to recreate them, so we could use them for our upcoming server. We haven't really been able to quite make them exactly the same of course, but they are very similar. They look like this (colored white). We came to the conclusion that we wanted to release these outfit. They are animated, and with the normal color palette from the normal retro outfits, you can also change the colors from white. I only included the edited outfits in the uploaded file, because you already have the normal color palette on your server. I hope some of you will value the rarity and nostalgia from these outfits.